To all you wonderful trans and gnc humans. Specifically, to those whose gender identities are continually being challenged, threatened and policed through legislation. In response to the erasure that we are being confronted with I am starting a project of visibility, affirmation and love. 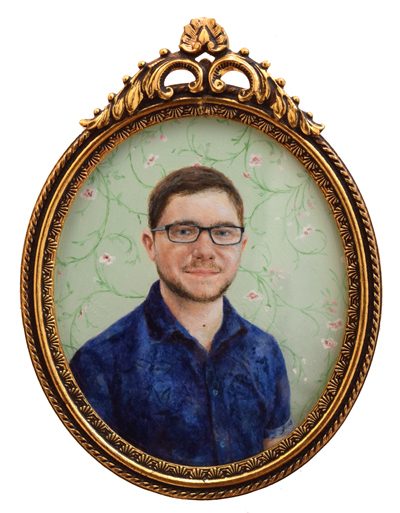 It is an art project in which I will be painting miniature portraits of as many folks in the community as I can. They will be around 1.5”- 3” and hung together as a large installation. Each one will be framed in a traditional oval frame that historically would hold the image of a loved one. You are all loved. The portraits are meant to honor each one of you and the installation to show the power of our community that cannot be erased. If you would like to be a part of this project please get in touch at cobimoules.portraits@gmail.com. All I would need is a portrait of you. It can be as simple or as wild as you like. Just make sure that the photo is of good quality without any harsh shadows across your face. Once I finish your portrait I will send you a print of the completed painting and keep you updated on the projects progress and any exhibitions in the future. Much of my work has been about my own visibility as a queer and trans person but with everything that is happening I am finding the power of community to be especially important. PDF download. Please pass this along to anyone that you think might be interested in participating!